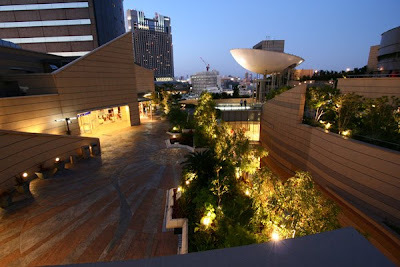 Namba Parks, located in Osaka, Japan, represents the antithesis of the traditional shopping center. This is a shopping complex with offices, an amphitheater, landscaped parks, green spaces and water together. Built inside the former Osaka Stadium sporting place, the old ballpark was designed by Jon Jerde Jerde Partenership Agency. 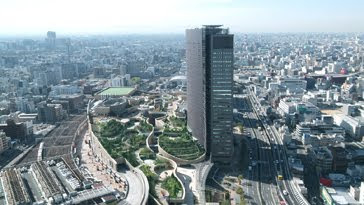 Namba Parks was designed as a redevelopment around a business district next to the Namba train station, close to Kansai Airport. Opened in October, 2003 at the former site of Osaka Baseball Park. A multiple shopping complex of 1 story underground and 8 stories above ground. Some shops and restaurants made their debut in Kansai area. Outdoor event space is a round theater. Also equipped with roof top garden, Parks Garden. 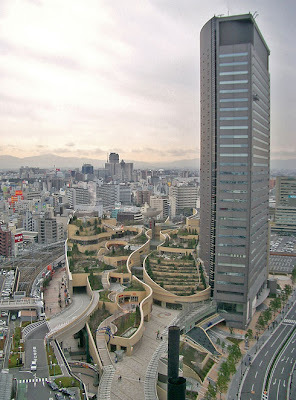 Namba Parks was designed as a park. In a city where nature is rather rare, the sloping park connects to the street, making it accessible to pedestrians, allowing them to wander through its groves of trees, piles of rocks, lawns, streams, waterfalls , ponds and outdoor terraces. Under the park, a canyon trace the path of specialized activities, entertainment and catering. It is an oasis in the city where people can enjoy trees and flowers while taking a walk and can rest on the benches. Memorial plates are buried at the spot on the 2F, where home plate and pitching plate were located. More shops targeting adult men and women will open as second stage in the spring of 2007. Cinema complex and specialty stores will open as well.